Tough break for TMAC, as the Spurs didn’t even bother placing a name tag on his locker. Even Matt ‘Red Mamba’ Bonner got a name tag on his locker, but not poor ole’ Tracy. It’s been a rough couple of years for McGrady, being forced to play overseas in China, seeing his team miss the playoffs in the Chinese Basketball League, having to pretend he enjoys coming in the game only when the Spurs are up by 40 (Just in case!!! Can never be too careful!). But this time the Spurs have gone too far! Sure, Coach Popovich said he might be able to find him some minutes. By this he meant he wouldn’t find him minutes. But the team couldn’t even allow Tmac the dignity of having a name tag, a one time NBA superstar and hall of famer, reduced to sitting on the sidelines hoping to get Darko style minutes. Without even a tag to his name! 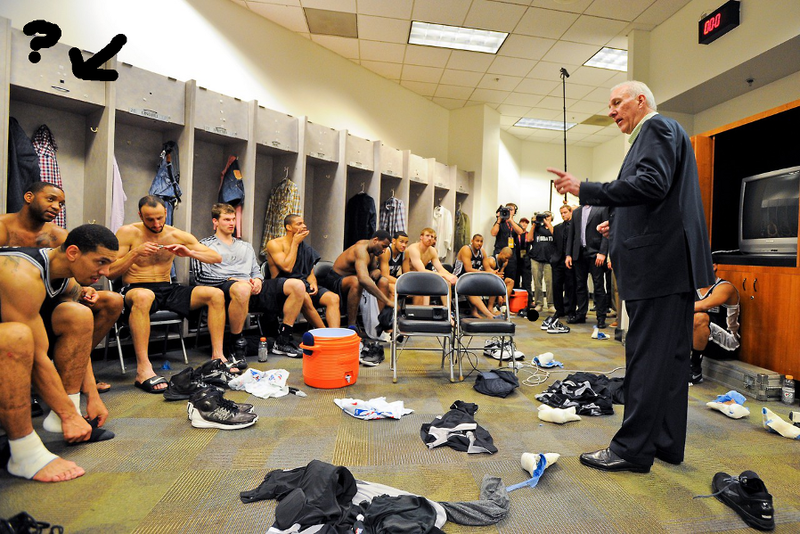 Ginobili is over there clipping his nails while Coach Pop talks, and he got a name tag. The question is will an opportunity arise for Tracy to finally play in an NBA Finals? To feud with his contemporaries one last time? To show LeBron and Wade, his offensive repertoire? To show them what’s it like to play basketball with men not boys like when he entered the league. Or is a name tagless lockerroom, and front row seats all that lie ahead for our once proud and humble hero? Will he retire if the Spurs win a ring in his honor? Better question with a lack of a name tag, will the Spurs withhold a ring from TMAC. Will Coach Pop and crew suddenly forget to send him an invite to the ceremony. “Oh I uh_forgot. It slipped my mind. I might be able to find you someone else’s ring though”. Aging truly is a cruel, cruel mistress. But not matter what age, give the man his name tag.